With our delicious variations on classic mashed potatoes, macaroni and cheese, and cornbread dressing, you'll find go-to side dish recipes suitable for any occasion. 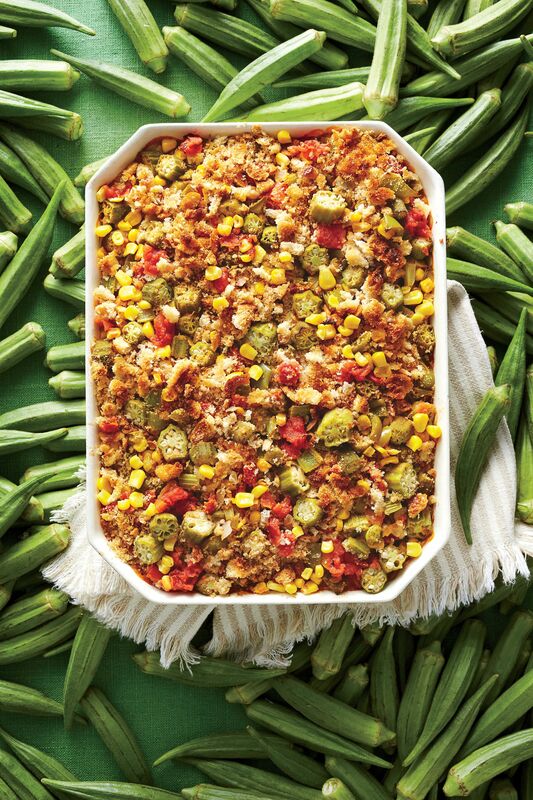 A casserole side dish fills your plate with a range of mouthwatering flavors and tastes at the same time. 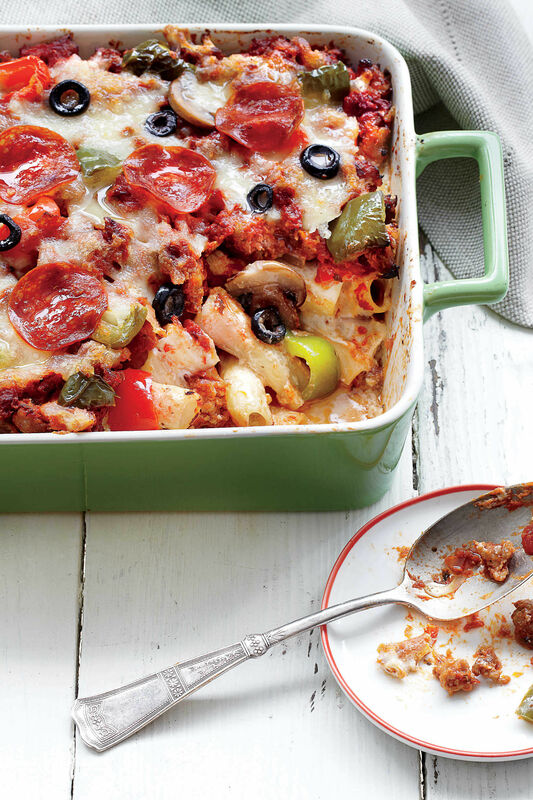 These easy recipes make preparing your favorite casserole side dish simple, too. Maybe you love the taste of a light and fluffy side dish casserole, like Butternut Squash Spoon Bread. Or if you’d prefer rich macaroni and cheese, you could dig in to the Baked Smokin’ Macaroni and Cheese, or Hugh’s Southern Mac and Cheese. If you want delicious spuds, try our Classic Parmesan Scalloped Potatoes, Mashed Baked Potatoes—which mixes up the traditional mashed potatoes, and the Fennel and Potato Gratin. 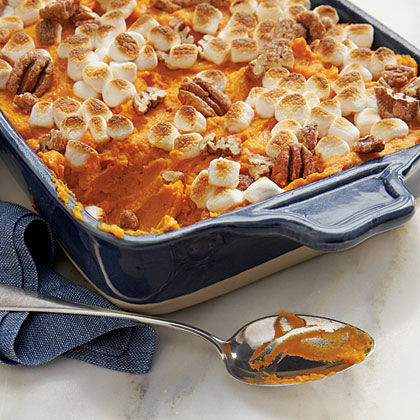 If you prefer sweet potatoes, you can’t go wrong with a casserole side dish like the Sweet Potato-Carrot Casserole or the Cornflake, Pecan, and Marshmallow-Topped Sweet Potato Casserole. However you slice, scoop, or serve your favorite casserole side dish, these recipes will make getting it from oven to table easy. If ever there were a versatile side, this is it. This scalloped potatoes casseroles goes with everything, and there's certainly nothing quite like creamy, homemade scalloped potatoes for dinner. This easy recipe tastes divine even as leftovers the next day. This lavishly rich casserole is ideal for family suppers, and it will complement everything from Italian entrees to the panoply of chicken and beef dishes in your kitchen arsenal. Gently stirring this dish twice while its baking promotes even cooking and adds some creaminess to the dish. Pull it out of the oven, stir once more, then sprinkle with cheese, and continue baking without stirring for a casserole that's golden brown on top. This sweet potato casserole is always going to be amazingly nutty and crunchy, but adding cornflakes cereal to the pecan-brown sugar topping gives the casserole extra crispiness. Each topping tastes beautifully toasty, and comes together in a medley of flavors all rolled into a single bite. The Cornflake, Pecan, and Marshmallow-Topped Sweet Potato Casserole is a rich and filling dish, sweet and savory at the same time. Set this down on the sideboard for a buffet-style Thanksgiving meal and your friends and family will be piling their plates high. They’ll also marvel at how beautiful it looks with its rows of cornflakes, pecans, and marshmallows spread diagonally across the top. This delicious mac and cheese is light on butter and cheese, yet it still melts in your mouth. It’s the perfect recipe for a comfort food with some smoky flavor and interesting textural nuance. So it’s a crowd pleaser, but its far from ordinary. You can change the flavor profile of the recipe with combinations such as sweet peas and proscuitto or ham and broccoli. Make it your own, this recipe can stand up to creativity and invention in the kitchen, in fact, it practically requires it. It will be a fantastic side dish on your dinner table, and it will be so loved that it may become an entrée dish. Hugh Acheson—chef/partner of the Athens, Georgia, restaurants 5&10 and The National, and James Beard award winner for Best Chef Southeast—has provided the South with some of the most delicious and inventive foods of the past decade. This mac and cheese recipe is no exception. Acheson’s recipe for Southern Mac and Cheese combines 2-year-old aged cheddar cheese with Gruyère cheese, diced bacon, and leeks, creating a blend of flavors that is nothing short of addictive. The results are a deliciously baked Southern classic that's finished with a drizzle of heavy cream and toasted breadcrumbs. There’s truly no mac and cheese like Hugh’s Southern Mac and Cheese. Few things embody the true taste of the South more than a classic Shrimp and Grits, and what better way to bring the taste of the Lowcountry to your Thanksgiving table than through this incredible must-try dressing. Apart from the usual shrimp and grits, this dressing brings the flavors of breadcrumbs, bell peppers, green onions, and Parmesan cheese to the table. This may become your family’s go-to dressing, or you may find yourself making this dish at any time of the year. Everyone loves a twist on a classic, and once you taste this Shrimp and Grits Dressing you will understand why. Spoon bread is a favorite dish for many Southerners. 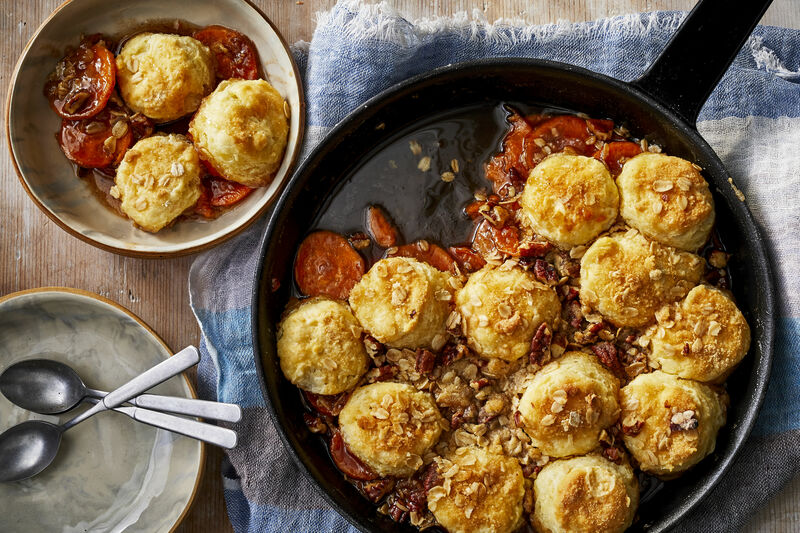 Grandmothers and grandfathers passed the recipe down through the generations, sharing love of Southern cooking and love of a good spoon bread. This spoon bread is made even more delicious—and even more Southern—with the addition of fresh butternut squash. So scour your local farmers’ market and take home the nicest squash you can find. It will cook up beautifully in this spoon bread. For the ideal texture, we recommend serving this immediately once baked. This is a great recipe. Don’t be surprised that you like the recipe so much it finds its way into your Thanksgiving dinner menu and weeknight repertoire. 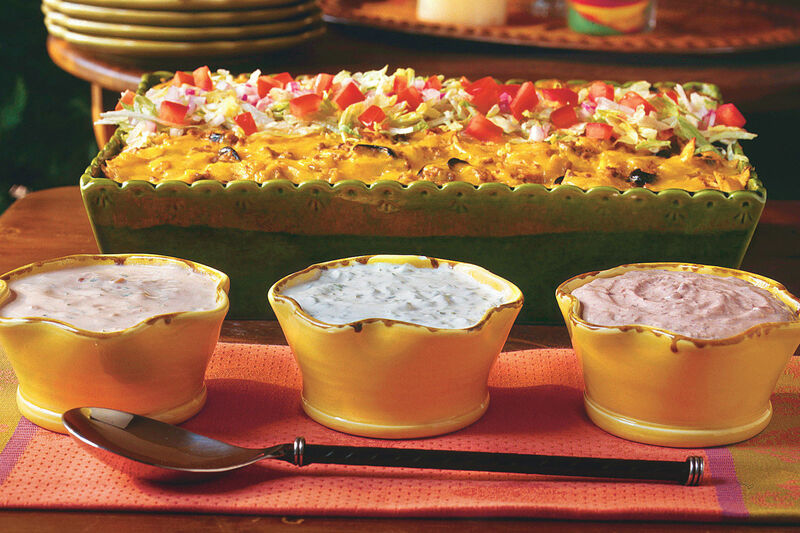 There are few dishes more satisfying than a corn pudding. It’s the perfect blend of savory and sweet, soft and crisp, vegetable and bread. In our recipe, this tasty side dish takes a quicker approach to classic corn pudding. You'll love the abbreviated preparation and cooking time as well as the cheesy Parmesan twist. 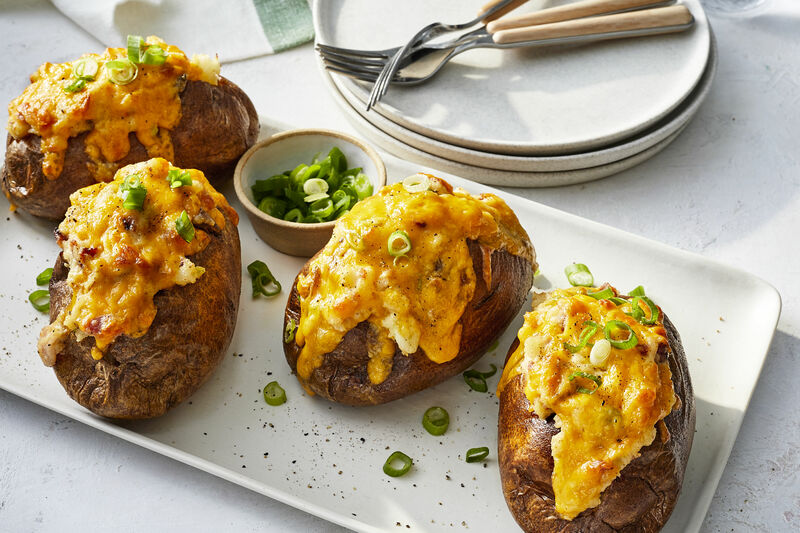 If there’s one thing everyone loves, it’s a creative way to deploy cheese on the dinner table, and we think we’ve found one of the best in this recipe. The Parmesan adds a bite that blends with the smoothness of the corn pudding just beautifully. You may want to make two batches of this recipe. The first will go quickly. 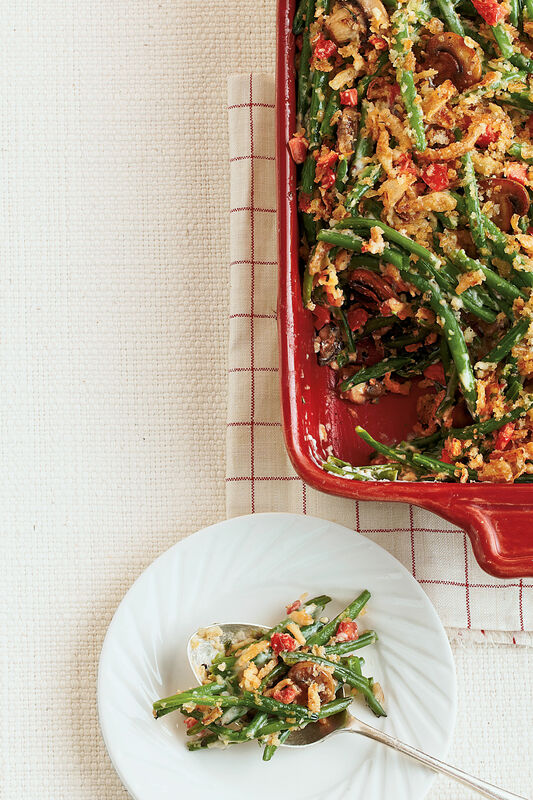 Everyone needs a reliable green bean casserole in their recipe box, and we think this is a great one to add to the rotation. This green bean casserole gets a much-needed makeover—from classic to extraordinary—thanks to the efforts of crisp, fresh veggies and a lightened (but still super-rich and delicious) homemade sauce. With smooth mushrooms and the crunch of panko, this is an explosion of texture that will elevate whatever entrée its paired with. This feels like an incredibly indulgent treat, but we have to tell you that the best part is…it's under 200 calories per serving! Can’t get better than that. One of our favorite days at the farmers’ market is when summer squash appears on the tables of local farmers and their families, all of whom come out on Saturday mornings to sell their produce and talk with members of the community (all of whom are salivating over the fresh blackberries and peaches that are set out in the summer breeze). Summer squash casserole is one of the most versatile Southern side dishes, and it gets its due on dinner tables across the region. We think that it pairs well with everything from fried chicken at a summertime Sunday lunch to roast turkey at Thanksgiving. Mix up your mashed potatoes routine by trying one of these five delicious variations on the classic side dish. Adding just a few well-chosen ingredients to the classic smooth potato mash creates something special. Tasty additions like caramelized onions and chorizo sausage will make these mashed potatoes a family favorite. Beyond comfort food, these mashed potatoes become a family treasure. If you write down all of the variations, adding in the ingredients your family loves, this recipe will become practically an heirloom. We’re partial to the caramelized onions, but the chorizo sausage is a savory, fantastically flavorful addition that conjures a Southwestern, Tex-Mex inspired flair. Cooked carrots can taste surprisingly sweet, so you’ll savor their flavor in this fantastic Thanksgiving side dish. The carrots also add smooth texture and extra flavor to this comfort food favorite. You can serve this classic holiday casserole any time of year and expect rave reviews. 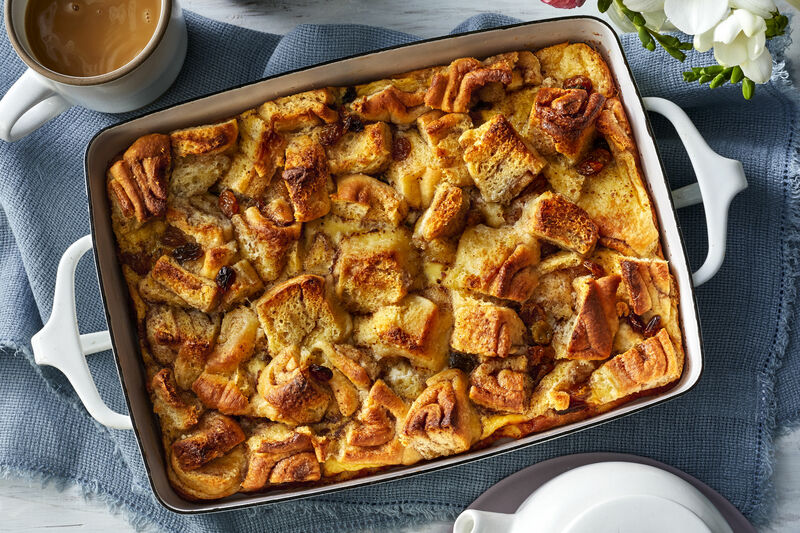 This casserole is topped with marshmallows, but it also has a special ingredient: our Sugar-and-Spice Pecans. You will love the combination of heat and sweet that these bring to this amazing dish. So get your sweet potatoes roasting in the oven and get ready to enjoy this great dish that is fantastic to share with your family and friends at Thanksgiving, but just as delicious whenever you feel like making it. There’s nothing quite as delicious in the summertime as fresh zucchini, squash, and corn—and there’s certainly nothing like it when that trio of fresh vegetables are baked together in a flavorful side dish casserole. Soft, white breadcrumbs double as a feather-light binder and a golden crumb topping, since they brown ever so slightly atop the casserole and add a subtle crunchy texture to the smoothness of the zucchini, squash, and corn. To make the bread crumbs, pulse torn slices of day-old white sandwich bread in the food processor until they are an ideal size. They’ll be perfect casserole toppers—and easy and cost-effective, to boot. This cheesy potato gratin gets a punch of flavor from nutmeg and fennel. It's impressive enough for a holiday party, but it is also easy enough to put together on a busy weeknight. We like the combination of nutmeg and fennel for a holiday party—there is a depth of flavor in the combination of spice that adds such a substantiality to the dish. It feels very special amidst flickering candlelight and shimmering holiday decorations. It’s a perfect complement to roasted turkey, sweet ham, or sliced beef. It’s also easy enough to whip up en masse if you have a large group to feed. French fried onions are the quintessential addition to a green bean casserole, and they make a lovely, crispy complement to the savory blend of green beans. But why limit French fried onions solely to green bean casserole? We think they are a versatile addition that can lend a sense of playfulness and crisp texture to some of our favorite side dishes. 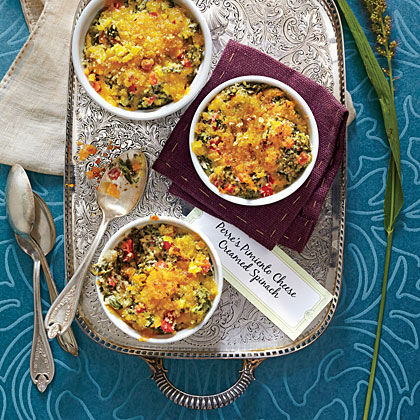 We certainly love them on this cheesy squash casserole. French fried onions plus cheese is indulgent, but it is tempered by the texture and flavor of squash, which grounds the dish in the heft of fresh vegetables—always a good thing. 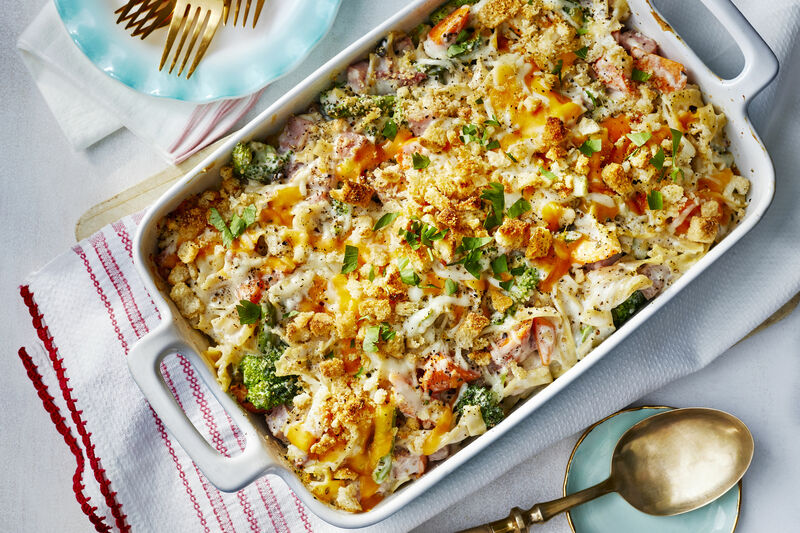 Mouthwatering doesn’t even begin to describe this delicious casserole, but mouthwatering is the closest, all encompassing adjective we can find to describe the sweet, smooth, substantial, crunchy, fluffy concoction of a sweet potato casserole. It is truly delicious. This classic sweet potato casserole is perfect on any occasion, and it is bound to satisfy lovers of crunchy pecans and cornflakes as well as marshmallows, since all three ingredients work together in this casserole to create something special, a casserole that blends flavors and textures boldly. 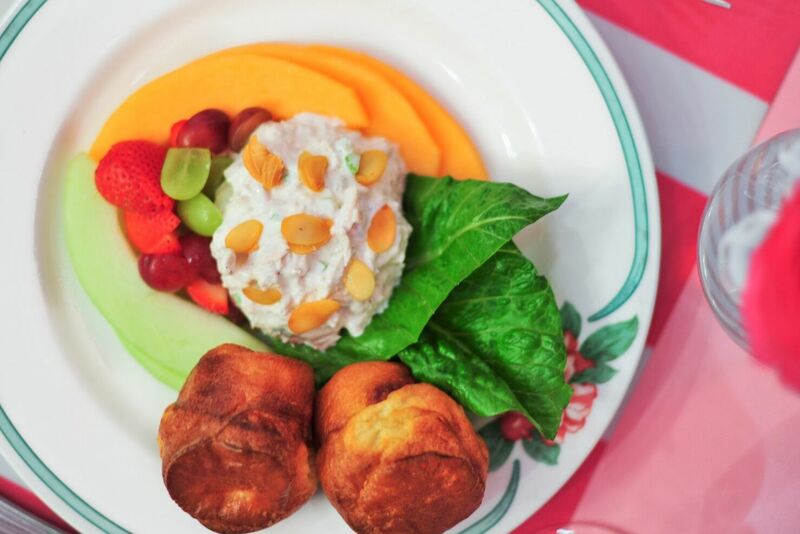 It gives dinner plates everywhere the delectable memory of sweet potato, a memory we want to relive at every dinner. We know and love potato gratins, but the addition of butternut squash to this beloved dish has made us fall for it all over again. Butternut squash goes well with so many dishes, but its addition to gratin is really out of the ordinary. The butternut squash and potatoes blend beautifully, and they add both heft and flavor to the casserole dish. Preparation tip: You’ll want to slice the potatoes as you use them and place them in each layer (rather than slicing them all at once). Doing this will help to prevent oxidation in the potatoes and will ensure that your dish is as fresh as can be.